Updating a bathroom can be the best investment of your remodeling dollars in terms of both your personal enjoyment and resale value. 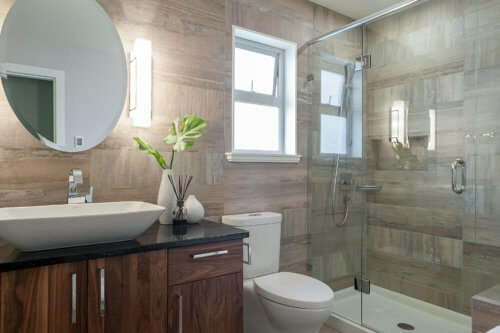 Across the US, homeowners report that a bathroom remodel costs around $8,000-15,000 for an 8×10 space, and depends on the quality of materials you use. A complete renovation involves replacing old fixtures (sink, faucet, shower, tub), installing new countertops, vanity, flooring, wall tile or paint, and new lighting. Lets take a look at the cost of labor and materials for a standard size, master, and small bathroom. We will also cover the most popular remodeling updates for a bathroom, and offer money saving tips, so you can avoid overspending. Most homes have either a 5×8 or an 8×10 bathroom. Doing a complete renovation in bath of this size costs $5,500-6,000 on the low end, and $8,000-14,000 for a mid-range quality remodel. This estimate includes all labor and materials, except for plumbing and electric work. The simplest and most cost-effective way to do a complete remodel and transform the look and feel of the bathroom is to replace all fixtures, install tile, replace flooring and add a fresh coat of paint on the walls and ceiling. Using standard size materials and prefabricated fixtures keeps installation and labor costs at a reasonable level. The minute you request any custom work, your costs can double or more compared to the average rate a contractor would charge for a straight forward job. When you browse remodeling estimates for a bathroom on various home improvement websites, you may notice that the prices quoted are very different from what your friends and neighbors have recently paid for a similar remodel. The reason for this is that online you typically see “national average costs”, which don’t take into consideration local market rates. In reality, contractors can charge a lot more than this average, or a lot less, depending on where your home is located. In areas where the economy is bad, contractors are willing to work for very low rates, compared to what pros would charge in upscale areas such as New York, San Fransisco, Boston, Seattle, etc. For an accurate price quote, you should contact 3-4 local remodeling pros, who will evaluate what needs to be done in your bathroom. This will allow you to find the best deal, instead of signing the contract with the first guy who gives you a quote. While design trends are constantly changing, one that still wins the popularity contest is a contemporary style bathroom. In these, neutral or warm, earthy tones of paint, tile and counters are favored. Tones of beige, cream and grey are most popular. 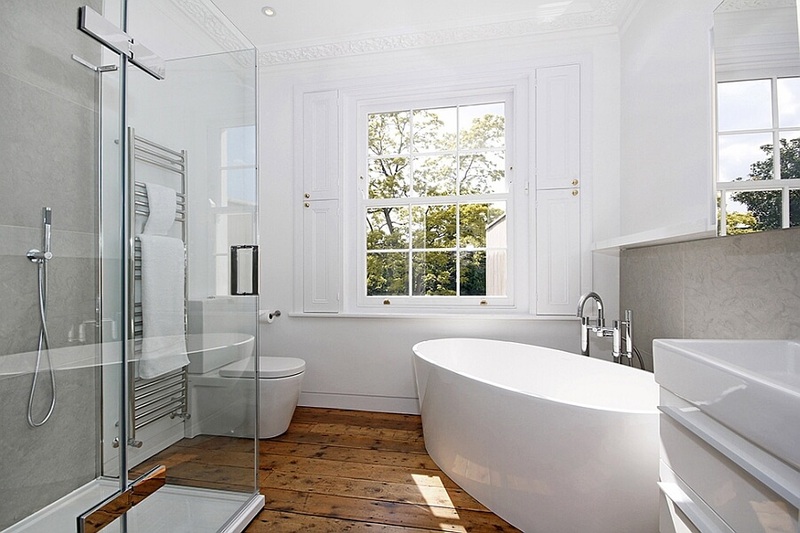 White bathrooms are still in style, and this one you simply can’t go wrong with. Many upscale remodels incorporate the use of glass and metal into the design. Ultra modern bathrooms that feature an industrial flare will use exposed brick wall accents, stainless steel, and ceramic wood tile. If you are putting your house up for sale, its best to stay away from the latest fads in colors, as well as as overly bright or shiny tile choices. 1) Higher End (not luxury by any means) – typical (middle class) single family house. 2) Middle of the Road – first home for a young family on a budget / high end rental property. 3) Low End – rental property. Of course, there are many more combinations that you can do, but for the purpose of simplicity, we will stick to these two. Also, note that all price quotes are sourced from Home Depot in MA, so they will be very close to those that you would pay at this store in NH, TX or OR, or almost anywhere in US. Keep in mind, that since there are so many suppliers and brands, prices for the items we list can vary greatly. That’s why we chose the big home improvement store (Lowe’s too) as our price source. One last thing – this is a remodeling scenario – not new construction, so all plumbing and electrical connections are already in place, and will not be calculated! Tools, and labor required for installation are not included. If you want to update your master bathroom, be ready to spend. On average, homeowners report that remodeling a master bath costs $15,000-25,000. However, the budget can easily reach $50,000-75,000 if you are installing luxury fixtures, doing all new plumbing and electric work, moving walls to add square footage to the existing bathroom, putting in windows or skylights, as well as using the highest quality building materials. Size is the greatest factor that will determine your final cost. A master bathroom that is 12×15 will cost significantly less than a room that is 20×18 or larger. For such a major remodel, its best to hire a designer and a general contractor who will oversee all the work, purchase materials, and coordinate other sub-contractors: plumber, electrician, tile installer, painter, etc. If you are changing the layout of the space, its recommended to work with an architect or a designer and get various layout options, so you can choose one that best meets your needs. In recent years, master bathrooms are built to include designated areas for him and her, such as dual vanities, and a dual shower outlets that are installed in the same stall. Steam, jacuzzi, a bidet, aromatherapy and chromotherapy are additional luxury features that many homeowners like to put into their master bathrooms. On the opposite end of expensive master bathroom remodels, are updates for a small bathroom, half-bath or a powder room. Most homes (especially older ones) have at least one small bathroom in desperate need of an upgrade. The good news is that this remodel doesn’t have to cost a fortune. Low-key remodels for a 5×7 bathroom cost as low as $4,500-5,000, while the reported average cost is around $7,500-11,000. An upscale small bathroom can be as much as $16,000-18,000. New vanity, cabinetry, faucet and shower heads are also installed. Many people also opt for tiling or at least partially tiling the walls, doing a backsplash, and putting tile in at least one of the tub/shower walls. One of the most costly updates in a bathroom of any size is trying to change the existing layout and move around essential fixtures, such as the toilet, sink and tub/shower. While you may feel that doing this move will significantly improve the functionality and convenience of the bathroom, you should be ready to pay the price. 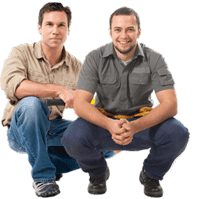 Professional plumbers charge $60-75 per hour. If you only need to slightly shift a particular single fixture, such as the toilet, but it will still remain close to the original pipe lines, you can spend around $1,000 on this. However, making any drastic moves requires major work and reconfiguration of the water, drainage and vent pipes. This is where the cost skyrockets into thousands of dollars, and can start out at $2,500-3,000+ to move a single fixture. This will also require at least 3 days of additional work for the plumber, and he will be charging you his hourly rate. Very often, you can improve the functionality and aesthetic appeal of your bathroom by replacing bulky fixtures and re-designing your storage solution. This can easily open up space in your bathroom and remove the sense that the space is crammed and cluttered. It’s important to have a working bathtub at least in one bathroom of the home. Kids make frequent use of the tub, but adults too often like to take a relaxing soak. Expect to spend an average of $2,300-2,500 to remove the old tub and replace it with a new acrylic model, if the piping is already in place. A popular tend in upscale master bathrooms is to install a stand alone soak tub, made out of stone, wood, and resin materials. These upscale tubs can easily cost $1,500 – 5,000. Another sought-after luxury feature is a jacuzzi tub. Depending on the size of the tub, its features, and number of jets, the cost can run anywhere from $1,250-15,000. Its possible to get a very simple, small size jacuzzi with basic features for as low as $600-800. On top of this, professional installation will be around $1,200-3,000 depending on the complexity of labor involved. In bathrooms where saving space is a priority and having a bathtub is not an essential feature, many homeowners choose to get rid of it all together, and install a large shower stall instead. This is often done in master bathrooms, if there is a tub in a designated kid’s bathroom, or in a small bathroom remodel, where a tub takes up too much space. In recent years, building oversized fancy shower stalls with custom features has become a trend in high-end bathroom remodels. Depending on the size and materials you want to use, a custom built walk-in shower can cost at least $2,500-4,000+, but can be as much as $7,000-10,000+ if you want to add features such as steam. A cheaper alternative is to install a prefabricated shower kit, with prices that range from $600-1,900+, depending on the size, panel, door and wall configurations. There are many sizes and styles to choose from. 36×36 shower stall is a very common size, and most people choose to get kits that have the bottom panel, wall, and glass door already in place. Many models are available in oval, angular, rectangle, or square shapes. As you can see, there are three quality tiers in the table above. Here is a more detailed break down of the materials that go into each renovation type. 1. Sink: a pedestal sink is used for a low-end remodel. A vanity with a sink top is used for a Mid and High-end job. 2. Toilet: the mid-range toilet is good enough for the “high end”. We just included a more expensive model for those who feel that the more expensive an item is, the better is the quality (not always true). 3. Wall tile: this is for Mid-range and High-end remodels only. Low-end option uses painted walls and bathtub liner. For Mid-range walls, we used $4 per sq.ft. tile with minimal use of “trim” tiles. For High-end, we used $9 per sq.ft. tiles, also with minimal use of trim tiles. Moderate and heavy use of trim pieces can easily add $300-500 to the total price. 4. Misc items: these are the small things that you can find around the bathroom, but which are not required. An example is a built – in soap holder, and toothbrush holder, etc. As you can see, there is about a $2,000 difference between each “level”. In most cases however, the mid -range is a pretty good choice for most people and offers adequate value. Some items can be swapped back and forth, but these are the real world prices that you will buy at a local big-box home improvement store. When it comes to renovation projects its very easy to overspend and waste money on features and accessories that are not essential. If you are on a tight budget, there are a number of strategies you can use to save hundreds and even thousands of dollars. Vinyl flooring is moisture resistant and comes in click-lock design, that is extremely fast and easy to install. Not only is the flooring material itself significantly cheaper compared to most tile, you will also be saving on labor charges. Overall you can install vinyl flooring for about 50-60% less than tile. Moreover, as the popularity of this flooring continues to rapidly grow, manufacturers are coming up with new styles and colors that were not available before. Just last week, I went to my local Bargain Outlet Store in Walpole, MA to look at flooring, at the manager told me that they currently have over 20 different vinyl plank style options, where as last year they had only 4! This is a clear indicator that people like this material and suppliers are delivering more options at very low prices. While completely tiling bathroom walls looks very beautiful and upscale, you can save a few thousand dollars by painting the them instead. If you still want tile on your walls, you can consider doing a small backsplash around the vanity, or an accent wall in the shower stall, or doing part tile, part paint on the walls. The cost of painting a bathroom will be around $300-700 depending on the size of the room. If you use tile that costs $6-10+ per square foot throughout your bathroom, your total cost will skyrocket. However, there is really no need for this. A smart alternative is to use cheap porcelain tile for the bigger portion of the flooring and walls, and supplement it with more expensive tile that you love, as accents. Its very easy to find a wide range of ceramic and porcelain tile for floors and walls that costs as little as $1.8-3 per square foot. Doing this alone can cut your tiling costs by at least half! Items like the shower stall, tub, vanity, and storage cabinetry are available in numerous prefab designs and sizes. They cost 40-60% less than their custom-built counterparts. If you are trying to save money, ready-made fixtures from big home improvement stores, such as Home Depot, can work really well in your bathroom. While having granite or marble on your bathroom counters looks amazing, its a luxury rather than a necessity. Depending on the size and material, this custom countertop can easily cost $900-2,000+. Instead, opt for a vanity that already comes with a countertop, it will be much cheaper. Its very easy to drop a few grand on items such as the shower head, faucet, toilet and sink. However, the truth is that these items just need to preform well, look stylish, and be durable; there is no need to overspend for any extras or expensive brand names. A faucet that costs $150 will be just as good as one that costs $800. Many people worry that if they use low-budget materials and fixtures their bathroom will look “cheap”. While this may be true if you go for the cheapest products, there are plenty of options that offer a happy medium between aesthetics, quality and price. Going to bargain building suppliers, looking for sales at Home Depot and Lowe’s, as well as shopping from online outlets can help you find great looking fixtures and accessories at a reasonable price. You just need to be willing to spend time hunting for these deals. 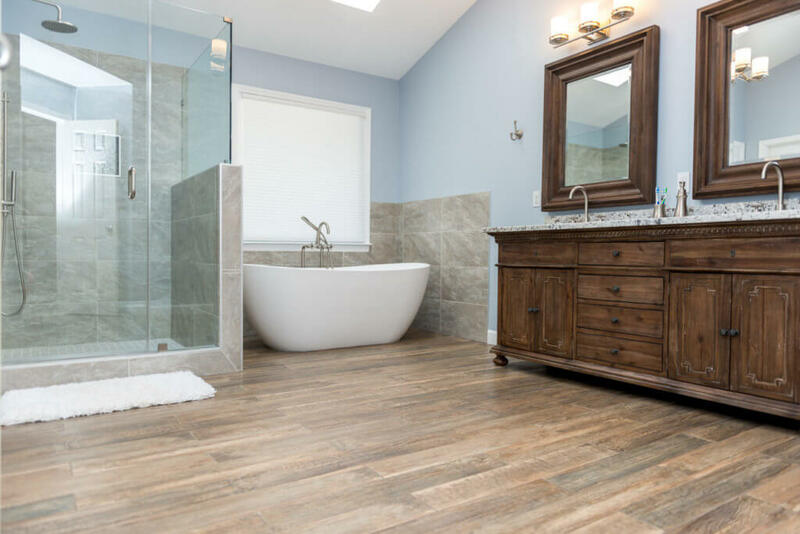 If you are remodeling a bathroom in preparation for selling your house, you should know that the average return on investment on this project is about 70-80% This should help you spend your money on the updates that make the best impression on prospective buyers. However, its often possible to recoup as much as 90-95% of your total spent, especially if its a small to mid-size bathroom that cost you under $12,000-14,000 to renovate. Typically, more expensive remodels that are over $20,000 don’t yield a very high return. Don’t waste money and time on making expensive improvements or purchasing over the top items that may only impress a few individuals. Most people can’t tell a difference between a sink that costs $350 vs $1,000, and the same is true for many other bathroom fixtures. Most people’s bathroom routine’s (especially women’s) require good lighting at all times of the day. This is especially important, if your bathroom has no source of natural light, such as window or skylight. Its best to put a variety of different light sources, such as main overhead light, one above the sink/vanity, one in the shower/tub, etc. Make sure your bathroom has some storage solution, whether floating shelves, cabinets, built-in shelving, etc. This will make the space functional, which is a big requirement for most people. If you are replacing a very old, ugly fixture, it is best to replace all the others as well (unless they are relatively new). This way you can get items that match, and have a “designer” high-end appeal. Otherwise, the space will look dated, with some fixtures that are sparkling new and others that are in an ok condition. If you can’t afford to spend a lot of money on major updates, putting in a large mirror or even two on the walls will do the trick. People love mirrors, both for the looks and functionality. They also brighten up the space and can make it seem bigger. Tile is one of the most noticeable and attractive features in a bathroom. Doing a single accent shower wall or a backsplash can dramatically improve the look of the room and make it appear more upscale. The high end column is very in line with our pricing. I appreciate a quick double check on estimates. Hope you produce alot more pricing! When you say adequate shelving, do you mean horizontal boilers? John, no we mean that your bathroom should have enough storage for random bathroom stuff – towels, toilet paper, etc, etc. What do you mean by horizontal boiler, and how is boiler related to shelves? First – that image is a computer render – not a real bathroom. Second – if that was real, that would be an indoor unit of a mini-split heat pump / AC – it’s not a boiler. By boiler do you mean heating system or a tankless water heater? And I’m still confused by your question – how does this “boiler” relate to adequate shelf spacing? I will try to answer the best I can, but you need to explain what it is that you are asking – I’m confused.